For anyone who hasn’t experienced the Northern Lights this ponder may fall flat as words can’t describe their magic. You don’t have to travel to Alaska or Norway to be touched by Auroras. The solar wind is raging at over 500 Km/second and an impressive geomagnetic storm is under way. Picture this storm as a shock wave caused by blasts of solar wind that compresses our magnetic field, sends it reverberating in all directions, and interacts with the magnetosphere, forcing this energy downward from the poles in a glorious display of light. 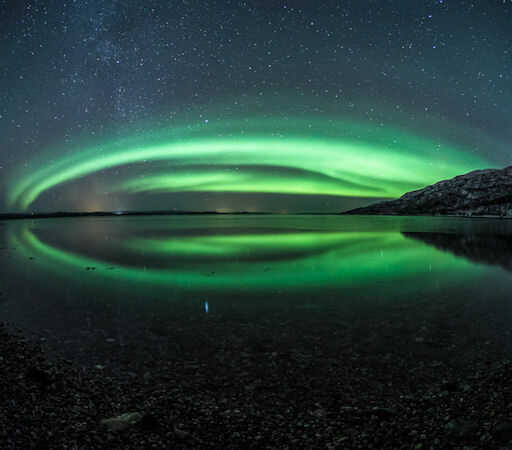 Worth adding to any bucket list is a trip to destinations within the “auroral oval”. In 1986 a massive storm resulted in auroras as far south as Texas. Bundle up the family, throw caution to the wind and head for Edmonton or Saskatoon when the solar wind blows, there’s no better way to start your understanding of the power of our universe.